Hubby loves samosa, but I always make sure he never has it. Yes, you may call me devil, but I really do not want him to serve him with any deep-fried stuff merely for his love for samosa. 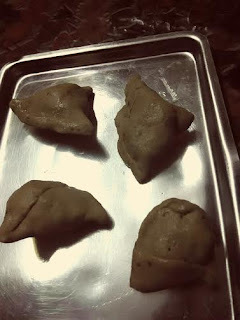 So I decided to surprise him with a baked samosa instead, that too made of whole wheat flour, little suji, and besan. I must accept that there is a difference between wheat and maida. Maida (all purpose flour) tastes better but it isn't the healthiest option. So I tried with wheat, as I am watching our food intake closely. My baked samosa tastes good, though it may not be the best, as we get from the halwai or its fried alternative. But since health comes first, taste can wait! Mix everything well and make a dough (should not be too hard). Keep covered with a wet muslin cloth for 1 hour. 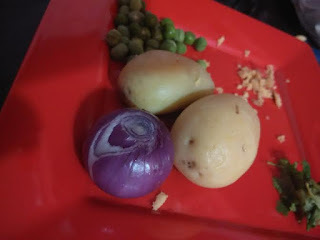 Mash potatoes and chop onion. Mix everything well and keep aside. Knead the dough once again and make small balls. Take one ball and flatten it like a chapati. 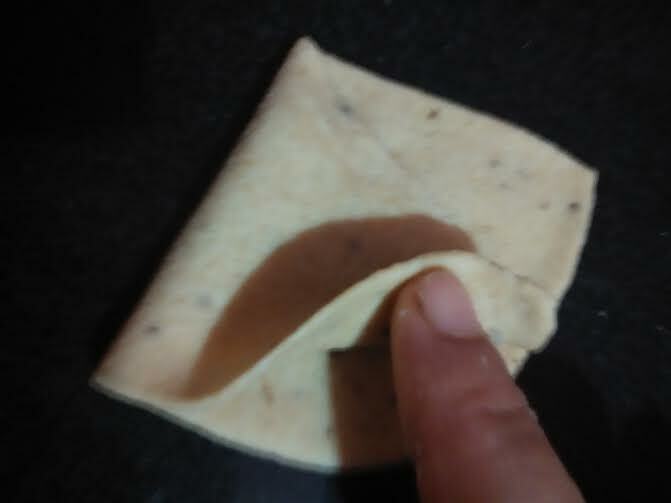 Cut into two halves and then fold one side over the other, as shown in the pic. 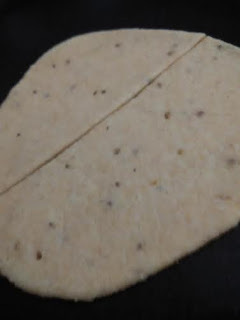 Add the filling and follow the same process with the rest of the dough. Preheat oven (microwave convection mode) at 180 degrees for 8 mins. 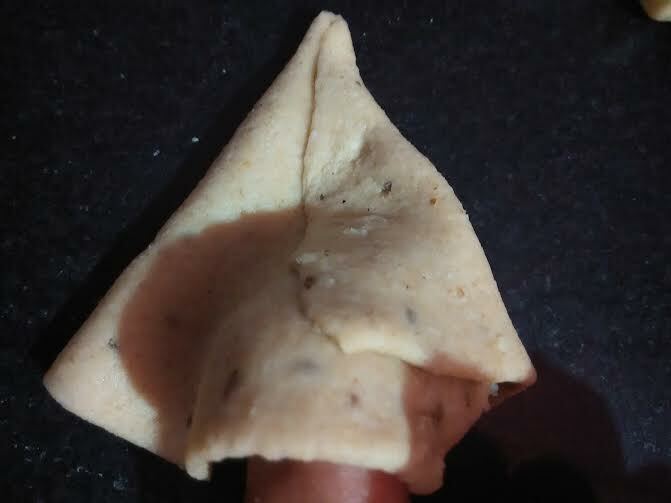 Meanwhile, brush the samosa with oil as they are preparing to go into the oven. Grease the tray and place the samosas over it. Bake for 12 mins. Then open the oven and turn the side of the samosas and bake for another 12 mins (may take more or less). Keep an eye on your samosas. 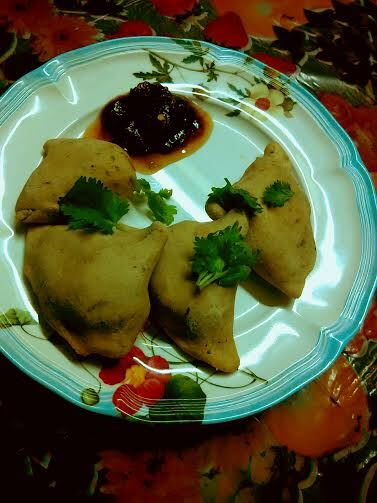 Enjoy baked samosa guilt free with coriander or tamarind chutney. Samosa hot hot is my family weakness and we literally dont even take the name of it ki kahi tempt na ho jaye... lol. All these years I have been avoiding and feast over only once a month. Now these baked ones are a big big invite ! Will def try them. Thank you, Poonam. 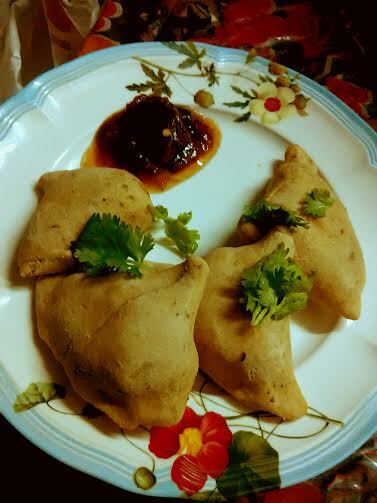 It was my first attempt at making samosas at home. I was greatly surprised with the result I got with whole wheat #samosa.